Just because it’s winter doesn’t mean the outdoor activities have to stop! 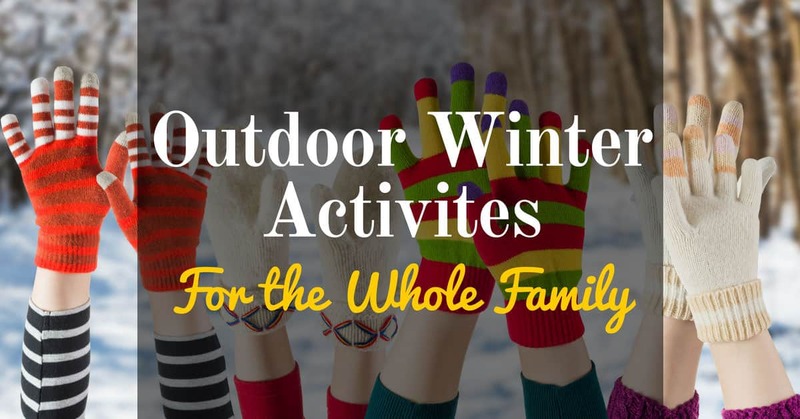 Help the family stay fit and have fun with winter activities for the whole family this season. Here are some ideas. Sledding/Coasting/Tubing Whatever you call it, sliding downhill in the snow is fun for all ages. You can use inexpensive plastic snow disks, toboggans, inner tubes, or just plastic bags. You can do this in your own neighborhood, or go to a local park. Make sure you bundle up and dress in layers, and wear heavy boots. Build Stuff Forts, castle, chairs, villages and snowmen are just some of the things you can build with snow. You could hold a family snowman competition to see who can come up with the most creative snowman design. It doesn’t just have to be snowmen, either – snow animals are a lot of fun, too. Snowball Fight! Plot your strategy and engage in a good old-fashioned snowball fight. Make rules and see that everyone follows them – no one should be hiding rocks in snowballs, for instance, nor should players throw hard or throw at the face. Skiing A ski vacation can be fun, but if that isn’t your style (or within your budget), look into cross-country skiing in your area, or one-day events at your local ski lodge. If you can rent or borrow skis, you might be able to do some cross-country style skiing in your neighborhood or at your local park. Lights Tour During the holiday season, your family can go look at various holiday lights displays. Get out and walk in the neighborhoods and park displays so you get exercise. Maybe your area is just plain cold with no snow, or no snow at the moment. A cold-weather hike may be just the thing. Bring a thermos of hot chocolate to enjoy on the trail. Have a cookout in the cold. Build a bonfire or camping-style fire at your local park or backyard. Heat water or milk to make hot chocolate, and roast some marshmallows to go with it. Ice games can be really fun – just make sure you’re on an authorized outdoor rink or other officially safe frozen surface – it’s not a good idea to go looking for frozen ponds that have questionable ice thickness. Ice skating can be fun for everyone in the family. Broom hockey is a fun ice game that doesn’t require skates (although you can play it that way).